This production opened on March 2, 2013 and closed on March 3, 2013. Shakespeare took decades to pen 37 works that changed literary history forever. It took us just two hours to undo all of that. Swamp Meadow Community Theatre asked for an audience to join them for a High Tea (or, if you will, Dessert Theatre) Fundraiser and a hilarious romp through their 2013 production of The Complete Works of William Shakespeare (Abridged) by Adam Long, Daniel Singer, and Jess Winfield. Shakespeare’s plays include a cast of hundreds of memorable characters. We will made do with just six! Performances were Saturday, March 2 and 7pm and Sunday March 3 and 2pm at the South Foster Fire Station. 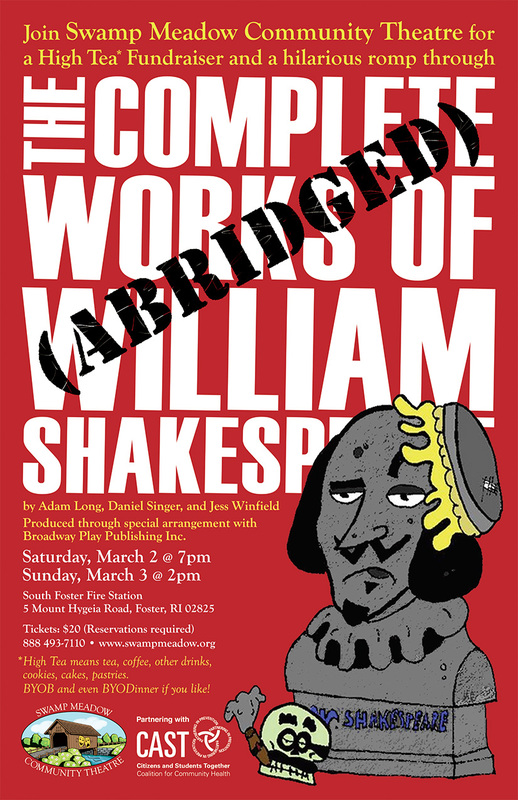 The Complete Works of William Shakespeare (Abridged) stars Preston Arnold, Tyler Vigeant, Amanda Betchy, David Gresh, Dale Miller, and Andy Affleck. Directed by Andy Affleck. Produced through special arrangement with Broadway Play Publishing Inc. The script to this play may be purchased from BPPI at BroadwayPlayPubl.com.